This set of cables provides a Grove connector on one end and four individual female jumper connectors on the other. 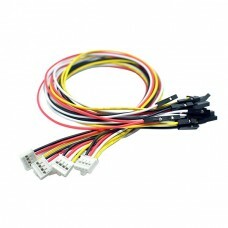 Each cable can be used to connect standard Grove compatible devices to a wide range of parts. Each cable converts a four pin Grove connector to standard female jumper pins. This package comes with five 20cm long Grove to female pin conversion cables.